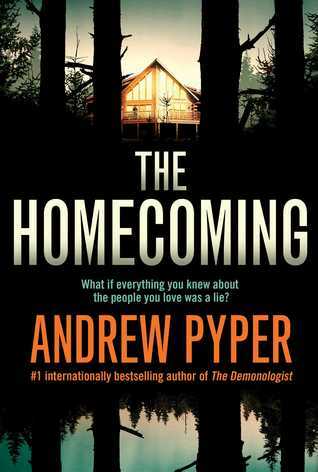 I had such high hopes for The Homecoming by Andrew Pyper, the author one of my favorite horror novels, The Damned. Unfortunately, this book only left me with disappointment as well as an incredulous disbelief at how such a great premise could turn out to be such a mess. And it’s a real shame, because the beginning showed so much promise. Our story begins in the isolated vastness of the Pacific Northwest rainforest as a limo carries surgeon Aaron Quinlan and his teenage sister Bridge to an undisclosed location, where a lawyer will be waiting to read the final last will and testament of their late father, Raymond. Soon, Aaron and Bridge are joined by their sister Franny and their mother Eleanor. In life, Raymond Quinlan had been a mostly absent father, leaving his wife and kids alone for months at a time while doing business for his mysterious employers, but apparently, the man had even more secrets than his family thought. They are all surprised when they discover that their drivers have brought them to a place called Belfountain, a sprawling estate nestled deep in the forest, exposing the extent of Raymond’s hidden wealth. And now all his assets including the property will belong to the surviving Quinlans—but with just one catch. As stipulated in the will, for Eleanor, Aaron, Franny and Bridge to claim their inheritance, each of them must remain at Belfountain for thirty days without any contact with the outside world, starting immediately. That means no phones and no internet. No supplies beyond the clothes on their back, since they had not been allowed to pack before leaving. Arrangements have been made with the people they know to explain for their month-long absence, or so the lawyer says. Food will be provided via regular deliveries. Despite their misgivings about the situation, the four of them agree to the terms. Any time one of them wants to bow out, the lawyer has assured them that a satellite phone would be available at the gates to call for a ride. Of course, anyone who takes a step off the property will forfeit their part of the inheritance, worth many millions, but Aaron tells himself that he’s not staying for the money—or not just the money anyway. He wants to know what other secrets Raymond Quinlan had been hiding when he was alive, and why his father concocted this strange scenario to bring his surviving family members together. Above all, he also wants to keep Bridge safe. But when night falls, Belfountain becomes a different place. Aaron and his sisters start having the same disturbing dream, and they start to catch glimpses of strangers among the trees, watching them. What’s more, the next day, a new group of visitors show up. And when Aaron discovers who they are, that’s when he realizes just what a twisted man his father was. All this takes place in the early sections of the book, and I have to say I enjoyed everything up to the end of this point. The mystery of Belfountain was compelling, and the way Aaron, his mother and his sisters were brought together by Raymond Quinlan’s will was simply too irresistible not to keep reading! Was this some kind of bizarre team building exercise? Some hidden camera reality TV show? I wanted to know! And then there were the shared nightmares and the scary people in the woods, giving this book the delicious eerie vibes that I love. I was also intrigued by the characters. While none of them were immediately likeable, on some level I understood that this was by design. The Quinlans are all flawed people, damaged by the emotionally and physically absent Raymond. Eleanor never felt like she was in a real marriage, with her husband gone more than half the time without ever telling her why. Aaron always felt like he needed to prove himself to his father, even long after it was clear the elder Quinlan didn’t care. Franny turned to drugs and became an addict. And Bridge grew up looking up to Aaron as her father figure instead. Because of this, the two of them are extremely close, even with the age difference. In fact, their special sibling bond was something that touched me deeply even from the very beginning. But then, something happened after the first quarter of the book. All the mystery and intrigue that was painstakingly developed became lost in a confusing story that neither establishes a convincing explanation for everything that happens nor conveys much suspense or excitement. Even the character relationships became immaterial because of the so-called “answers” we were provided, and with that, the last saving grace of this novel went down the tubes. And then there was the political stuff, which was so completely irrelevant and unnecessary to the plot that it stuck out like shiny red hotpants at a funeral. I don’t mind message fiction, but when it’s so unexpectedly, blatantly, awkwardly, and NEEDLESSLY shoehorned into a story like this, it annoys the hell out of me. Regrettably, I can’t say much more or rant about a lot more other stuff that didn’t work for me without revealing spoilers, but to sum it all up, this book just didn’t feel like it was that well thought out. There were more holes in the plot than Swiss cheese, and the ending did not provide any satisfying answers. This is the sort of novel that demands the reader to suspend their disbelief, but even for me, it was simply asking way too much. I finished this book with even more questions than I had at the beginning, but by then I confess I was feeling too disconnected to the characters or story to care much at all. It’s just too bad. The Homecoming had so much potential when it started, but sadly it failed to follow through in every way. Shiny red hot pants at a funeral. Seriously, it is the worst when authors inject their agenda when it has absolutely nothing to do with the plot. Don’t they realize it’s so obvious? It doesn’t really sound that great and I think I’d probably have a tough time with the characters! Excellent review though! The characters were so frustrating. The worst part was, I understood why they had to be that way, but sadly it didn’t make me feel any more positive towards this book. Ah, too bad. I loved The Damned too! Granted, that’s the only book of his I’ve read, and he’s written several others too, I believe. Yeah, The Damned was SO GOOD. I read The Only Child last year but that was only so-so. This one was just a disaster, however. Oh no! I’m to the part where it took a dive for you. I am loving it but had to take a break for my buddy read of In the Valley of the Sun with Stormi. Maybe it will work for me as I’ve not read any of his other books yet. Although I can say so many bloggers have loved In the Valley of the Sun and it’s not working for me so I may just be on a bigger bust once I read this one. I look forward to your thoughts when you’re done. I’d be curious to see what you make of some of the weirder explanations the story gives! Oh no, I so liked The Damned and I was looking forward to your review of this one. Still, it’s not as though I’m not overloaded with books so perhaps I’ll count it as a bonus that I couldn’t request this one. Shame it didn’t work out though after such a great start. Yeah, Andrew Pyper and Paul Tremblay – two authors whose first books I read by them were brilliant, but none of their works since have managed to wow me again. Shame when that happens! Sorry this one was such a disappointment! Aw, man. I was nervous about this one and waiting for someone I trust to review it. I still haven’t read The Damned so I’ll read that one instead! I definitely recommend The Damned over this. I loved that one! In comparison, The Homecoming was a mess.